The Australian Square Kilometer Array Pathfinder (ASKAP), part of the future Square Kilometer Array (SKA), will soon start work. ASKAP contains 36 antennas, each 12 m in diameter, spread across 4 km but working as a single telescope. 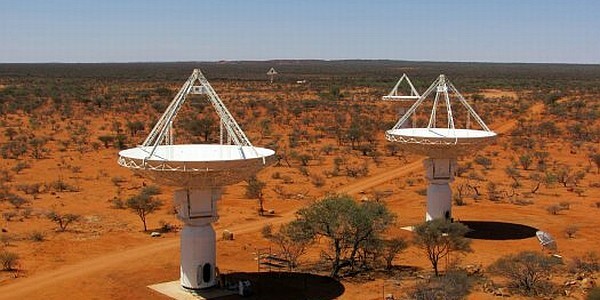 The SKA will consist of many thousands of antennas spread across Australia and South Africa. The universe is now 13.7 billion years old. A flash that bathed the cosmos in light 400,000 years after the big bang during the epoch of recombination when atoms formed gives us a snapshot of its infancy. Radiation from that flash is now the cosmic microwave background. Tiny variations in its temperature show how the atoms were clumped. Gravity pulled the atoms into stars and galaxies. The first stars consisted solely of hydrogen and helium and were monsters that burned bright and died within a few million years. Nuclear reactions within them created the heavier elements that went into the mix for later stars and planets. Their high-energy radiation ionized hydrogen atoms from the epoch of recombination. This epoch of reionization, which is thought to have ended some 700 million years after the big bang, gave rise to the cosmos we see today. The center of every spiral galaxy seems to host a black hole with a mass millions or billions of times that of the sun. One theory is that they began as star-sized black holes and slowly grew by sucking in gas and surrounding stars. Yet a typical supermassive black hole would need longer than the age of the universe to swallow enough material. Another theory is that they were just born big. We don't know whether UV light from the first stars or X-rays from the growing black holes caused the epoch of reionization. Neutral hydrogen gas was abundant in the cosmos between the epochs of recombination and reionization, and it gives off a faint radio signal that we can detect. The electron and proton within each hydrogen atom act like two bar magnets that can lose energy when their spin flips. A flip to opposite directions releases energy as a photon with a radio wavelength of 21 cm. A flip into the aligned state can occur by absorbing a passing photon. The emission or absorption of 21 cm radiation over patches of sky is a sure sign that hydrogen atoms are present. Because hydrogen is ionized by high-energy radiation from stars or galactic black holes, it can help us map the distribution of stars and galaxies. Hydrogen emissions from the first billion years after the big bang are stretched by cosmic expansion to wavelengths of around 2 m. The longer the wavelength, the larger the telescope required to detect it with the necessary resolution. In a radio telescope, incoming photons from a distant source overlap and are recorded as a single continuous wave. This wave can be sampled at different points by many widely distributed small antennas and combined by computer algorithms into a coherent signal. Because Earth's ionosphere interferes with radio waves, the signal is corrected by referencing coordinates to a network of radio pulsars. Individual bright radio sources, diffuse radio emissions from our own galaxy, and human radio noise can be filtered out. The first definitive detection of hydrogen from the epoch of reionization is expected within the next five years. The Square Kilometer Array (SKA) in South Africa and Australia, to be completed in Australia by about 2020, with many thousands of radio antennas over a baseline of 3,000 km offering a total collecting area of one square kilometer, plugged into a supercomputer, will give us a better view. NASA is examining a possible 21 cm observatory on the far side of the moon. AR This is a great story. Hope I live long enough to see some good results.